The Velocity Trigger for AR-15 rifles is a Single Stage Drop-In Trigger that provides a nice, clean & crisp trigger pull. The attractive price makes a quality AR-15 trigger achievable with any budget. Simple installation makes the process easy & quick. Available with a 3, 4 or 4.5lb trigger pull. These feature a curved trigger. Recommend using: Anti-Walk Pins Part# 452-015-028 Not to be used with 9mm conversions or other recoil operated conversions. Der Velocity Auslöser für AR-15 Gewehre ist eine Bühne Drop-In Einabzug, das bietet eine schöne, saubere & knackig abzudrücken. Der attraktive Preis macht eine Qualität AR-15 Abzug mit jedem Budget erreicht werden können. Einfacher Installation macht den Prozess einfach & schnell. Erhältlich mit einer 3, 4 oder 4.5 lb abzudrücken. Diese verfügen über einen gebogenen Trigger. Empfehlen: Anti-Spaziergang Pins Part # 452-015-028 nicht mit 9 mm Umbauten oder andere Rückstoß betrieben Umwandlungen. Really great for the price. In my experience it breaks better than a couple of the CMC triggers I use. The install is ok, different, the set screws are easy to tighten and hold the trigger tight. I can't detect creep, the pull feels very consistent and the trigger breaks at just under 5lb. One odd thing is that the safety rubs on the back end of the trigger, I think it will wear in with use. I think the 4.5 lb. trigger is a great way to go for self defense, I have a 3.5 CMC that I only use for target and squirrels because it's so light. These are made very well. I like the NP3 nickel teflon on the hammer/sear and the black DLC coating on the trigger bow. It was easy to install if you follow the directions. You have to remove your grip then safety selector. But I think it only took me about 10 mins. even taking my time. Make sure to tighten both tension screws and then add & tighten the set screws on top of those with no Locktite. Observations: With the safety on, the trigger has zero play. There is no slack or creep when pulling the trigger, crisp break, then no overtravel. The reset is nicer and more positive than expected. To be fair I don't have many AR triggers to which to compare this Velocity 4lb curved trigger. However, I have shot many types of firearms with many different types of triggers. I installed it in a new AR build, BCM upper, T2 buffer. This trigger is crisp, fast, the reset is also short and crisp, no discernible creep. It currently breaks at 4.6lbs and I suspect it will lighten up some with continued use. It was easy to install and is a definite upgrade to the trigger that came with my lower parts kit. The price is much better than of other triggers that seem to be of comparable quality. Brownells shipped it quickly (I'm an Edge member). I deducted one star because the trigger's safety bar causes the safety selector to drag when going from fire to safe. Velocity was responsive to my inquiry and offered to grind it down if it bothers me. If it dragged going from safe to fire I would have done it. There are user suggestions online, such as backing out the trigger screws a bit and backing out the grip screw a bit, neither of which seem safe to me and neither of which worked in my case. All in all I love this trigger, just wish it didn't affect the safety selector. Very easy installation with no modifications. Trigger is crisp and smooth. Perfect for bench rest or prone shooting. First off, these triggers are excellent. I have 4 of them in different pull weights both curved and straight and in different AR platform configurations. The ONLY reason I rated this one 4 stars is due to, either a heavy parkerizing on the set screws or heavy anodizing on the trigger body. I had to work in the set screws in the thread channels in order to successfully seat the screws against the bottom of the trigger well to set the tension for the trigger pins. This may not be everyone's easy fix, but does not detract from the quality of this product. I bought one earlier this year from another vendor and I liked it enough that I bought a second one. AR15 magazine did a review on it once and the writer said it was almost as good as the ELF trigger which he considered the smoothest. He stated this one is really close and the best deal available in after market triggers. Both of my 3lb triggers break at a little over 3 1/2 lbs. which I prefer anyway. I have this trigger on a SBR 300 Blackout. Mine has zero creep an breaks under 3 lbs I've had no issues in the time I've had it around 2 years. I have 2 Timney trigger in other AR-15, Wilson Combat TTU in my 18" 3 gun rifle an a Chip McCormick trigger in my 6.8 SPC deer/hog hunting AR. Honestly, I can't tell the difference in this trigger an the Timney 3 lb trigger. A word of advice for all Triggers for a AR platform rifle spend extra money an buy a set of anti walk pins, I had to learn this the hard way at a 3 gun competition when the mil spec pins walked out an it was very for me. I bought this without any rating or comments....I was pleasantly surprised ,this is exactly the trigger I needed to complete my varmit rifle build . price was right ,performance ,,just unbelievable! easy to install , works well with spikes lower . I typically use CMC 3.5lb ,but thought I would try Velocity and save a few bucks. You know the old saying "you get what you pay for". It's a 4lb pull and sloppy, better use a trigger block with this trigger when you're installing or cleaning your gun. I'm sticking with what I know works from now on. I have always worked with mil-spec triggers on my rifles that were approximately 7 lbs. I tried this trigger and discover consistent sub MOA groups on that AR with a 3.5 lb break. My son now calls it my cheater rifle when we compete. I have 2 more on order. I bought this for my wife's rifle because her stock trigger pull was over 7#. I put this trigger in her rifle and her groups are half what they were with the stock trigger. It breaks just a hair over 3# and my wife couldn't be happier with it. Trigger is a great value for the price. I have spent money on drop-in triggers costing twice as much, and was not as pleased as I am with this trigger. 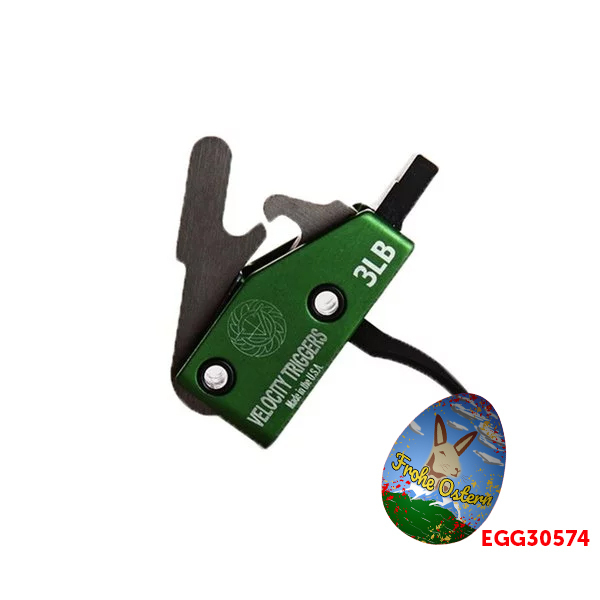 My bench mark trigger is the JP set, which I have in my competition AR. Keep in mind you will spend a fair amount of time fitting the JP fire control group. The Velocity 3 lb trigger would be tied with another brand as my 2nd prefferd trigger choice. Bottom line, this trigger is absolutely worth the money spent. A great trigger in 2 minutes vs 90 minutes. I installed this trigger in a 6.5 Grendel build. It was simple to install. Not having to install anti walk pins was an unexpected bonus, and should probably be added to the description. the 3 lb curved trigger has a small take up and then a near perfect break. total install time 15 mins. I liked everything about this trigger EXCEPT it pulls at 5 lb, not the 3 lb it is marked as. I dropped it into a Balios Lite Gen 2 receiver set matched with a ODIN 20" grendel barrel. Too bad it did not deliver the 3 lbs as it is crisp, easy to install, and has a great reset. I will replace it with a Timney. I just received 2 Velocity 3lb trigger assemblies and both are just a hair over 3lbs. I checked the trigger pull and gauged them at 3 and1/8lbs pull or less. Both have a really nice and crisp pull with no creep. I put them both in standard AR15 lowers with both being installed with stock parts kit pins. Installation is easy and quick to do. They both installed firm and tight with no movement at all in the assembly. All I can say is follow the instructions and use the lock screws. The pins are tight and firm. I even tried to knock out the pins with no movement to them, to ensure they would not creep out during use. I have 3 Timney triggers now which I have had for years and I would consider Velocity triggers equal to them in my opinion. As a dedicated Prairie dog shooter I tolerate no issues that can ruin a trip. The value for these triggers is great. I can buy 2 Velocity triggers for the price of some other manufactures triggers and have equal performance. Bought one of these triggers about a year ago, finally got around to finishing my AR and taking it to the range. Well this trigger was great the first trip, I was blown away how awesome it was. Second trip was a different story. Gun would always double tap very unsafe! There is a screw on the bottom side of the trigger that just keeps walking itself out. Trigger is unsafe, I guess I could put Loctite on it but whats the point? I'm not about to trust my life with a gun that has a trigger that may or may not work properly. Fühlt sich in allen Details wie mein 3lb Timney an, denn ich in meinem anderen OA15 verbaut habe. Ausgetauscht wird ein Uhl der wegen nicht fühlbarem Reset für schnelle Schussfolgen wenig geeignet ist. Leider recht lange Lieferzeit aus den USA, aber es ist es wert. Ich habe den Velocity Trigger in meiner Sabre Defence XR15 M-5 verbaut. Aufbau und Funktion unterscheiden sich quasi nicht vom Timney; auch der Einbau erfolgt nach dem gleichen Prinzip. Der Abzug bricht glasklar ohne Kriechen. Meines Erachtens ist der Abzug jeden Cent wert! Herstellerproduktnummer: V1001T Die Geschwindigkeit Auslöser für AR-15 Gewehre ist eine Bühne Drop-In Einabzug, das bietet eine schöne, saubere & knackig abzudrücken. Der attraktive Preis macht eine Qualität AR-15 Abzug mit jedem Budget erreicht werden können. Einfacher Installation macht den Prozess einfach und schnell. Erhältlich mit einer 3, 4 oder 4.5 lb abzudrücken. Diese verfügen über einen gebogenen Trigger. Nicht zur Verwendung mit 9 mm Umbauten oder andere Rückstoß betrieben Umwandlungen. Die Geschwindigkeit Auslöser für AR-15 Gewehre ist eine Bühne Drop-In Einabzug, das bietet eine schöne, saubere & knackig abzudrücken. Der attraktive Preis macht eine Qualität AR-15 Abzug mit jedem Budget erreicht werden können. Einfacher Installation macht den Prozess einfach und schnell. Erhältlich mit einer 3, 4 oder 4.5 lb abzudrücken. Diese verfügen über einen gebogenen Trigger. Nicht zur Verwendung mit 9 mm Umbauten oder andere Rückstoß betrieben Umwandlungen. Herstellerproduktnummer: V1002T Die Geschwindigkeit Auslöser für AR-15 Gewehre ist eine Bühne Drop-In Einabzug, das bietet eine schöne, saubere & knackig abzudrücken. Der attraktive Preis macht eine Qualität AR-15 Abzug mit jedem Budget erreicht werden können. Einfacher Installation macht den Prozess einfach und schnell. Erhältlich mit einer 3, 4 oder 4.5 lb abzudrücken. Diese verfügen über einen gebogenen Trigger. Empfehlen: Anti-Spaziergang Pins Part # 452-015-028 nicht mit 9 mm Umbauten oder andere Rückstoß betrieben Umwandlungen. Herstellerproduktnummer: V1003T Die Geschwindigkeit Auslöser für AR-15 Gewehre ist eine Bühne Drop-In Einabzug, das bietet eine schöne, saubere & knackig abzudrücken. Der attraktive Preis macht eine Qualität AR-15 Abzug mit jedem Budget erreicht werden können. Einfacher Installation macht den Prozess einfach und schnell. Erhältlich mit einer 3, 4 oder 4.5 lb abzudrücken. Diese verfügen über einen gebogenen Trigger. Empfehlen: Anti-Spaziergang Pins Part # 452-015-028 nicht mit 9 mm Umbauten oder andere Rückstoß betrieben Umwandlungen.